Genie Music, a music platform owned by mobile carrier KT, is preparing to develop a visual music platform using hologram and augmented reality technologies, with an aim to provide immersive media content in the era of the fifth-generation network, the company announced Wednesday. 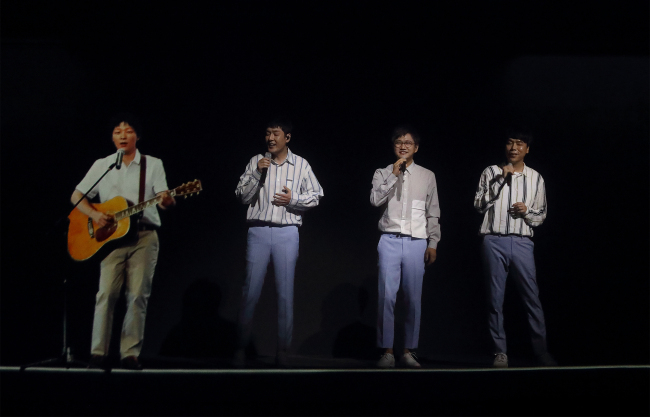 During a press conference at the K-live concert hall in Sangam-dong, northwestern Seoul, the company staged a short joint concert featuring late pop singer Yoo Jae-ha and the group Sweet Sorrow, visualized in hologram form. Genie Music’s parent company KT has been developing hologram technologies under the Genie Holo 1.0 strategy since 2014. For the holographic presentation of the late singer, KT applied its floating hologram technology that uses a high-resolution projector. Genie Music aims to complete application of KT’s three-dimensional hologram and virtual and augmented reality technologies to its media content by 2022. The music platform will also provide an artificial intelligence-based curation service that automatically recommends songs and other content. The AI-based platform will work not only on KT’s Giga Genie speaker, but also Naver’s Clova and Samsung Electronics’ Bixby. 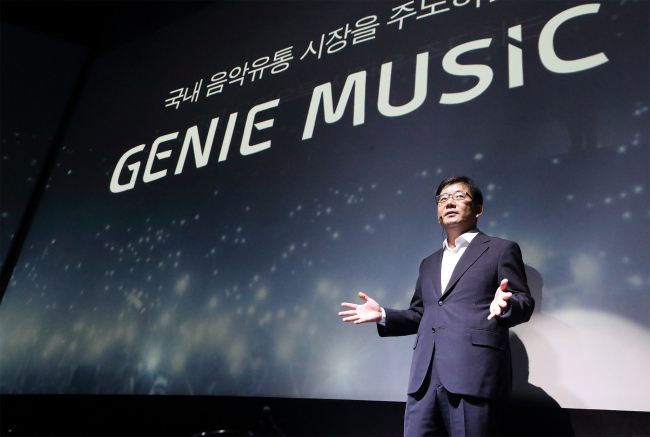 Genie Music’s board approved a merger with CJ DigitalMusic, the operator of online music site Mnet.com, last month. CJ DigitalMusic is owned by CJ ENM, an entertainment and media content company. When the merger is completed on Oct. 10, CJ ENM will become the second-largest stakeholder of Genie Music. The merger is expected to help Genie Music expand its share of the music distribution market, and provide a greater variety of content for users. “Due to new technologies and devices, the way of consuming music is changing from ‘listening’ to ‘watching,’” said Chung Hyung-jin, senior vice president at CJ ENM. With the visual music platform plan, Genie Music aims to attract more than 5 million paid subscribers by 2022. Current market leader Melon, formerly owned by SK Telecom, has an estimated 4.55 million subscribers. The combined number of subscribers of Mnet.com and Genie music is estimated to be 2.65 million.